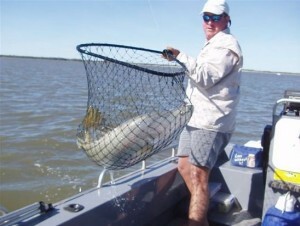 If you’ve only got one day to spare in the search for a Barra, this tour provides a Barra fishing experience within an easy drive from Darwin. On a Barra fishing day tour you will also get to experience some of sights and sounds that you don’t necessarily get on a land based tour. This one day Barra fishing tour will take you to one of the Northern Territory’s tried and tested Barra fishing locations depending on the local conditions at the time. Some these locations include Corroboree Billabong, Shady Camp, Darwin Harbour, Bynoe Harbour, and Adelaide River. The vessel used for this tour is a 5 meter custom built Barra boat built to NT Marine Survey will full shade canopy if required. This tour starts early in the morning giving you the best chance of a Barra at one of the Northern Territory’s well proven Barra spots. Top End Barra fishing is operated by Kurt Oswald who specializes in giving you personal guidance in your quest to catch some of the Northern Territory’s most prized fish. 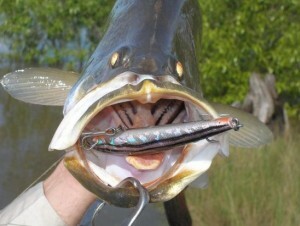 Top End Barra fishing specializes in Top End fishing around the inland waterways for Barramundi and Saratoga. 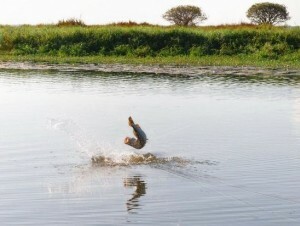 Kurt is a member of the Fishing Tour Operators Association of the Northern Territory. 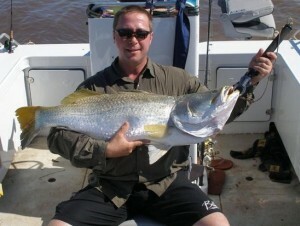 The fishing tackle used on Kurt’s charters is supplied by Fishing & Outdoor World in Darwin.